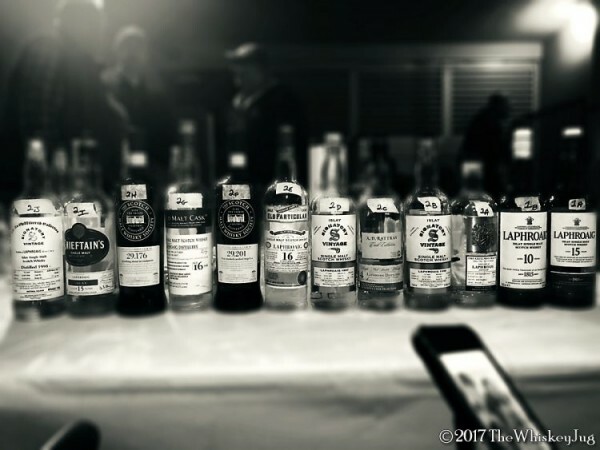 The format of this Malt Nuts Laphroaig 14-18 Years Tasting post is going to be a little less… less. Reason being, I wasn’t able to make it to the meeting but I had a bottle in the line-up and Chief Malt Nut Barry was kind enough to make me samples to try later. So I don’t have all of my typical photos to include. Please excuse the way it’s done, but really what’s important is the whisky and thanks to Barry I definitely have that covered! Since I wasn’t there I don’t know how cheery folks were, but we can assume everyone was happy as usual and there was Kosher food as usual and there was lots of joking and great photo ops as usual. We can also assume it was all blinded as usual which Barry replicated for me by only listing the codes on the sample bottles. So even though I didn’t drink with the group I still didn’t know what the whiskies were until I finished my notes and Barry sent me the key. Two rounds of Laphroaig, I’m still sad I missed the night, but very glad I got to try the whisky. Here we go! Nose: Pears, smoke, vanilla, plastic, mineral, saline and toast. Palate: Smoke, toasted malt, fruit, char, vanilla cream, saline. Finish: Long -> Smoke, oil, vanilla, fruit, plastic. Overall: B+ (87-89) A nice sippable Laphroaig, reminds me a bit of smoked sardines in a weird way and has a nice sense of depth. Feels very “classic Laphroaig” to me. I’m always hesitant to give something an A- as the first dram of the night, but was kinda considering here. Hell of a way to kick off the night. Nose: Fruit, dark sweets, smoke, apricots, iodine, brine, toffee. Palate: Fruit, caramel, smoked salt, charred marshmallow, plastic. Finish: Long -> Toast, smoke, fruit, oily spice. Overall: B (83-86) Shares a lot of characteristics with the previous one, but softer and more mellow in a way. It’s nice for sure and I’d drink it anyday, but 1A definitely stands out between the two. Nose: Toffee, smoke, cinnamon oil, butterscotch, vanilla, graham, band aid-like plastic. Palate: Smoke, cinnamon, sherry sweetness, butterscotch, vanilla, mineral. Finish: Long -> Smoke, malt, char, dried fruit. Overall: A- (90-92) This nabs an A- but just barely. It’s a good representation of a sherried Laphroaig, but it’s a bit off balanced, doesn’t feel 100% cohesive, but that’s splitting hairs because it’s really nice and turns out we tasted it in the previous Malt Nuts Laphroaig Tasting. Nose: Butter, smoke, apples, honey, banana, minerality. It’s a crisp sharp aroma. Palate: Smoke, orchard fruit, spice, minerality, plastic, butter, vanilla. Finish: Long -> Smoke, orchard, spice and minerality. Overall: B+ (87-89) A crisp tasty whisky and a solid representation of Laphroaig. Nose: Smoke, toffee, plastic, vanilla, acetone, apples, vanilla, heavy minerality and a bit floral. Palate: Fruit, smoke, plastic, stale spice, salt and SOAP. SO much soap. Finish: Long -> SOAP, smoke, fruit and more soap. Overall: C- (70-72) The aroma keeps it from a D+ but just barely, it’s hanging by a wisp of smoke. It’s so soapy and floral I thought Barry had slipped in an 80s Bowmore just to mess with us. I couldn’t finish my sample of this one, it was so dang soapy. Water and an hour of airing out didn’t dissipate it much. Bottled for Astor Wines in NYC. Nose: Vanilla, butterscotch, smoke, orchard fruit, plastic, lemon, spice. Palate: Minerality, plastic, fruit, smoke, cinnamon oil and toffee. Finish: Long -> Smoke, fruit, plastic and walnut oil. Nose: Pears, honey, peat, roasted malt, saline and plastic. Palate: Honey, smoke, apples, licorice, minerality and spice. Finish: Long -> Peat, spice, fruit and vanilla. Nose: Buttercream frosting, stone fruit, Smarties, vanilla frosting, graham, spice, peat. Palate: Vanilla, buttercream frosting, Smarties, herbal, graham, peat and dried apples. Finish: Long -> Vanilla, buttercream frosting, peat, spice. Overall: B- (80-82) Low end of the B- scale flirting with a C+. It’s so overly sweet and dessert-like I don’t even want to call it a Laphroaig, it’s like someone put a vanilla cupcake in the malting room for a bit while they were smoking the barley. Nose: Waxy fruit, peat, cinnamon, vanilla, honey and butter. Palate: Peat, malt, fruit, vanilla and honey. Finish: Long -> Peat, toffee, vanilla and fruit. Nose: Dried apples, honey, pears, malt, peat, spice and citrus oil. Palate: Peat, herbal, honey, vanilla, spice, apples and citrus. Finish: Long -> Peat, spice, fruit, honey and graham. Overall: B (83-86) Didn’t fully read as a Laphroaig to me and like with 2G I thought there was a possibility it was a hidden Caol Ila. Kind of a mid-B if I were to narrow it in a bit more. Not bad, but not good either. Nose: Malt, vanilla, mint, cinnamon oil, pears, honey, fruit. Palate: Fruit sweetness, peat, honey, malt, spice, herbal, plastic. Finish: Long -> Orchard fruit, peat, honey and malt. Overall: A- (90-92) Dude… yes. This is a lovely, deep and rich Laphroaig from start to finish, I love it. Nose: Sherry, roasted malt, peat, spice, cocoa, buttercream frosting, dark fruit, sulfur and oily spice. Palate: Dark fruit, sherry sweetness, malt, peat, spice, herbal, cocoa and sulfur. Finish: Long -> Peat, dried cherries, ash, nuts and cocoa. Overall: A- (90-92) Hands down my favorite of the line up, this is an incredible Laphroaig in every aspect. Deep, rich, dark and peaty I couldn’t ask for more. I mean I could, but who would care and give it to me so why bother, right? While I’m always sad when I have to miss a Malt Nuts meeting because I don’t get to hang out with everyone and get into lively conversations I will say it’s nice to be able to sit and taste through everything at home on my own. I broke it up into smaller flights, did it all over the course of 6 hours, everything was at room temp and since there was no time limit I could do a lot more A:B tasting and narrow my thoughts down on the whiskies. This was another amazing line-up created by the Malt Nuts, it’s really amazing how much my whisky knowledge and palate conditioning has improved thanks to groups like Malt Nuts, SCWC, LAWS and LASC. For those interested in the more nerdy side of whisky, I can’t recommend enough either joining or starting your own whiskey club. You’ll be amazed at the difference it makes to drink and share knowledge with quality people. 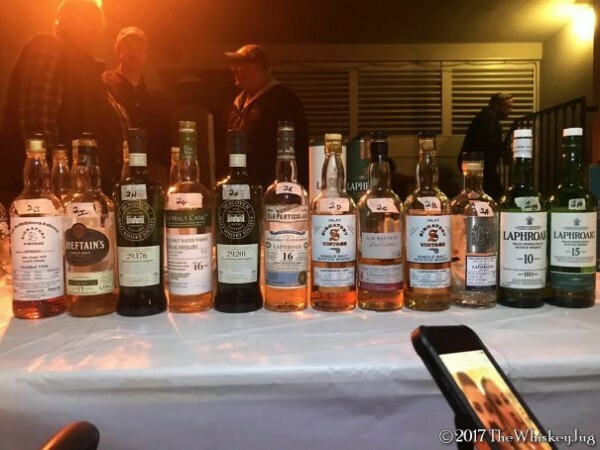 The post Malt Nuts Laphroaig 14-18 Years Tasting appeared first on The Whiskey Jug.